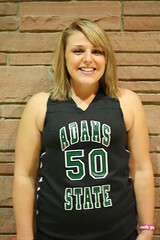 Adams State College sophomore women’s basketball player Caitlin Boal (Albuquerque, N.M.) has been named the ASCGrizzlies.com Athlete of the Week for the week ending on Dec. 4. Boal was the Grizzlies’ second leading scorer over the weekend, scoring a total of 35 points. She put up 13 points in ASC’s RMAC opener against CSU-Pueblo on Friday, Dec. 2. Boal also had a game-high and career-high 22 points against UC-Colorado Springs on Saturday, Dec. 3. Sixteen of her 22 points were recorded in the first half, and she also hit 4-5 from the three-point line before halftime. Boal recorded 19 rebounds on the weekend, with 14 coming on defense. She also had a steal in each game. The Grizzlies are now 2-4 on the season and 1-1 in conference play. The ASCGrizzlies.com Athlete of the Week award, which will be handed out weekly, was selected by a vote of media members and ASC athletic administrators as well as by visitors to the Grizzly website, who could cast their votes in an online poll. Boal received 26.8 percent of the online fan votes. This week’s other nominees for ASCGrizzlies.com Athlete of the Week included junior men’s basketball player Kaimyn Pruitt (Los Angeles, Calif.) and junior Ryan Fillingame (Victorville, Calif.).